I finished up what is basically my half of the block so now it will sprout wings and fly off to be stitched on by someone else! It will be interesting to see how it comes back! I have to admit its tough to add things like the buttons and all now, when there is still stitching to do. Its feeling seriously OFF balance to me! All the buttons are old vintage gems from grandmas button box. I'd do more but it wouldn't be fair to my swap partner! VBG! Now I think I know the advantages of blogging from flickr.... this will go to a bigger pic! LOL! Sorry for the dup, but wanted to fix the problem! Thank you everyone for your wonderful comments! I have finally completed a comfort doll for Pat Winter's project! She has been languishing on the sewing machine waiting for her backing and finishing touches..... now to finish her sister and then she can fly away to Pat!! I hope she will add a little bit of brightness and hope to someones day! UTS Charity Block 1 COMPLETE!!!! Block 1 is at long last complete!!! It no longer languishes on the sewing machine waiting for me to put its backing on!!!! Meet "Zipper" the Technocolor Tophat DogFish! LOL!!!! Got a bit carried away with the beading, but enjoyed the block!! I will have to try to find a place to hang the other blocks that came in and take pics and post them here as well! I am sooooo grateful to everyone that is joining in on this project. 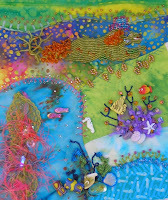 Linda in Ny sent the most gorgeous beaded mermaid and Debbie S sent two wondrous scenes with glorious fishies glinting everywhere! I know Jo in New Zealand has a treasure packed one on the way and I absolutely cannot wait to see the ones that Gail in Wyoming is stitching! A turtle and dolphin!!! PLUS she's adding a bonus of some hand painted fish and a sea horse!!! HOW lucky can we get???? THEN..... Judy in MN is working on one...... and Susan N fully surprised me by informing me today that she is preparing to make one as well!!! This project is growing wings and with it creating many smiles!!!! Thank you soooo much everyone!!!!! NOW..... got to finish the outside edge beading on the comfort doll, the pic and another project bites the dust!! VBG!! Sorry for the massive blitz in posting here, but when Dad's away..... Mom will POST!!! LOL!!! Here's a pic of a brooch I made for cq acquantaince (sp?) I like how she came out. I brain stormed and thought it would be neat to make some with a willowy bark face, maybe a mapley bark....ohhhhh....heck....the brain's been churning on alllll kinds of bark!! LOL!!!! Any way.....here she is!!!! 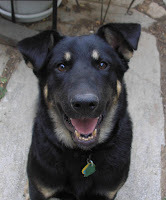 Weellllll...... Everyone has seen pics of Koda.... This first one, where the nose is niccccceee and clean.... smile is great! He's perfectly sweet and innocent. I'm happily pecking away on the computer when he trots in and plops his happy little back side down with a nose that is DRASTICALLY different from its normal color!!!! Hmmmmm....... Whattttt have weee been up tooooo??????? Soooooo...... I wander outside, expecting to see a crater the size of the moon in the middle of the yard..... fortuneately for him its only the size of a football, but we're not tellin' Dad!! LOL!!! 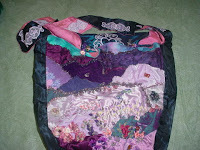 I previously posted a couple of quiltets that I have started for a project begun thru Crazy Quilting International. I've opened it up to the population at large, but I hadn't really explained fully the whole idea behind the project. The Ride For Kids is an organization that donates thousands of dollars for research each year. I am but a teensy weensy contributor to that grand scheme. I have a friend that conjured up, allllll by herself, over $11,000.00!!! I need to get some pics of the jackets that i've embroidered for her. They have come out pretty cool. We have listed all of the corporate sponsors on the back of her jackets the last three years running and she has been the State Grand Champion for the last four years. I'm impressed! LOL!!! Sooo, thats the "why" behind this project. I would like to brings some smiles to the faces of the kids in a local ward. I know that its not as effective as dollars for research, but it will help bring some joy to their souls. I hope some of you will be able to jump in and join the fun!!! Thanks again to Gail for adding me on her blog and anyone else who I may not have run across yet!!! Thank you, thank you, thank you!!! Kind of fun! A bit accurate too! Tooooo funny! LOL!! Like a tree, you are always growing and changing. And while your life is dynamic, you are firmly grounded. You have high morals and great confidence in yourself and others. You have a wide set of interests, and you make for intersting company. 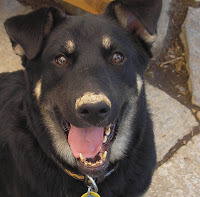 I occasionally like to mutter on about things i'm curious about or those, albeit HUGE, findings in the garden... LOL but I wanted to post a quick note about something thats come into my life and is gradually re-shaping it. Think that my slow posting here is a reflection of it. I was recently "diagnosed" with fibromyalgia. Not the end of the world, but definately a painful annoyance. At least it explains the new features around here, like hand and wrist pain that affects typing and stitching and well everything a hand does and thats not mentioning other areas of the body that aren't feeling so great either. I'm not posting this because I want attention, but because i'm slower at accomplishing things due to the pain that has jumped in with a huge "bang" and I am apologizing in advance for any hold ups. I'm adjusting and trying to learn work arounds while the silly medical community figures out some meds that might help. Thank you for your patience.....i'll be about as much as I can. Tomatoes, pumpkins and squash, OH MY!!! 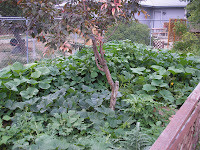 This year I enlarged our veggie garden quite a bit and after a rather rocky beginning, this is sort of what it looks like now!! It was measuring about 14 inches then..... and i've just discovered a cousin across the patch that is 15 inches! Pink Banana Squash.....shoulda read the package closer. Typical size is....well....what I have... typical weight... 10 to 15 pounds!!! OUCH!!!!! THAT'S a LOT of squash! LOL!!! Now i'll have to figure out a way to store it for gradual use! Boy....looking a little bit like squash cakes, cookies, soups, bread, noodles....ummmm.... any ideas??? LOL!!! Ohhhhh, myyyyyy!!! I am so humbled and speechless. I had no idea.... Thank you Jo and Hideko for thinking of me. So very sweet and I do VERY much appreciate it. It came at a time that I was needing a bit of a boost and thank you so much!!! 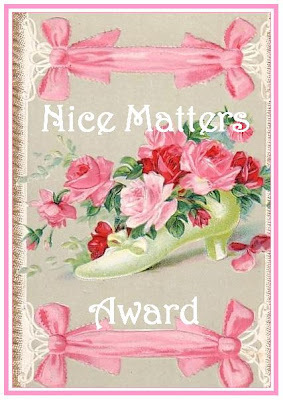 This award will be awarded to those that are just nice people, good blog friends and those that inspire good feelings and inspiration! Those that care about others that are there to lend support or those that are just a positive influence in our blogging world! That's just a bare beginning i'm afraid! THere are a bunch of other wonderful folks out there that have supported, helped, be-friended and in general cared ..... Pat, Clairee, Janet, Lauri, Susan.....just to name a few more! Thank you all ever so much for all you do and for absolutely MAKING my day!! 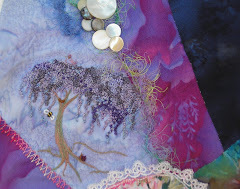 Today, I read on Gail's blog.... Big Horn Mountain Creations - quilting and crafts, about her disappointment with not being able to effectively sell her wares. I want to first say that I really understand where she is coming from! It hurts to hear that something you have worked so hard on is of little dollar value to someone. That said, I believe its symptomatic of the economy, which here in the West is rather tight AND its really important to display our creations in the correct venue. The audience and timing is everything. So.... Gail.... Please hang in there and keep at it! You WILL find your niche and things will work out! Just keep up the faith in yourself and your abilities! It takes time to develop everything! This is an issue I have struggled with for quite awhile, even within my commercial embroidery business as well. Theres always someone out there willing to sell "themselves" for less than you. I have actually done that occassionally just to keep the machine going, but have rather evolved past that of late because the customers themselves are more demanding than the little bit of money I get EVER begins to be worth. It skews the pricing for other embroiders too which defeats the purpose of being in business. So, I fired one of them this week.... graciously....but they have moved on and I can't say i'm sad about it. It frees me up to do what I need to do creatively! I "think" i'm evolving into what I am meant to be doing, which is using more of my creativity in special projects for folks rather than the run of the mill, 100 shirts with the same logo embroidered on them. 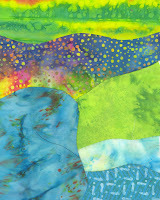 I am content to puddle along and experiment with new things as money allows. I'm challenging myself with new ways of doing things and operating under the "pay it forward" type philosophy. Its been amazing what comes back! It feels SOOO good to give of yourself with no expectations. With that in mind, I have headed up a project for mini quiltlets to be made into a wall hanging for the brain cancer ward of the Childrens Hospital. Why this specific choice? Well, i've been working with a friend for the last several years who participates in the "Ride For Kids". This charity is for children that have been diagnosed with brain cancer. This year, she collected over $11,000.00!!! WOW!!! I am soooooo impressed! And... she said that she is actually seeing that the donations are making a difference for the kids. Many are now in remission and finally enjoying better lives! As a result, I thought that it would be a nice treat for these kids to have a visual wonderland to look at and perhaps help take their minds briefly off their pain and the treatments they are under going and came up with this idea. At first I wanted to be able to give a quiltlet to each child, :(not dissimilar to what Pat Winters wanted to do with her Comfort Doll project) but that would restrict what we are able to put on them, so the project morphed into a wall hanging. 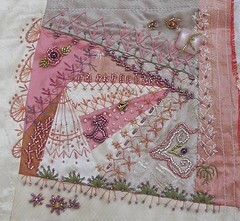 Each quiltlet will be attached to the others with free standing fish i'll embroider on my machine. Sounds fun, I think!!! Anywhoo, I would like to invite anyone who might be interested in making one to join in! The theme is Under The Sea. These are my two nekkid blocks that will be formed into quiltlets. If you are interested in perhaps joining in...please let me know and I will HAPPILY send you the guidelines. Dependent on the response, I may extend the deadline that is currently set for September 30. 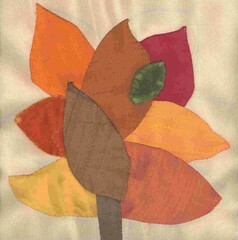 Heck, if this goes well, maybe we'll make this an on going project and donate wall hangings to other Childrens Hospitals! The more quiltlets created in love for these courageous kids the better!! I can't WAIT to see their smiles when its delivered!! Thanks for reading and listening. Off I go to get some things done!! This is the first time that I have participated in the Its In My Bag Swap! It was interesting....even tho I stressed a bit. You see, i'm not a planner. If I get an idea I sort of dive in and work things out as I go. Now, had I planned this would have been a bit less challenging, BUT I learned a lot and truly hope that Clairee enjoys her purse. I am NOT a great seamstress and Clairee is, sooo, i'm still waiting to hear her scream!!! LOL!!! Seriously tho, I am over all pretty pleased with it and am THRILLED to be able to finally show it!!! 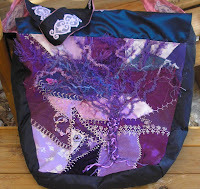 The front of the bag, pictured above, is fabric manipulation techniques. I created some mountains for her to enjoy with some flowers of ALL kinds tucked in at the base. 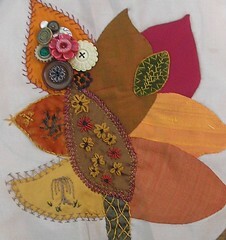 There are some SRE, some brazilian and some basic embroidered flowers there. Along with another mongram for her enjoyment. I added her charms up at the top. The flap closure has more lace embroidered onto it and the inside is completely lined with a zippered pocket in the middle separating the purse into two sections. This is the back of the purse. I decided to make it more flat so it would withstand brushing up against her body. There were furry fibers included in the baggie so I decided to play around a bit and VOILA, a willow emerged from the fibers!!! Theres a little nest on one of the limbs with some eggs and a bird I made out of fimo to match the purse. I also added her monogram and a pansy....i'm suspicious that she likes pansies! LOL!! You can just see the handle at the top. I machine embroidered some lace patterns on it to give it some extra zing! Next challenge will be to make some of that free standing to put on some blocks! These are some extra goodies I added for Clairee. I made an ultrasuede pansy pin with picot beaded edging on it. I also sent along some of the fimo doo dads that I had made...the top one is made into a pin as well. Sooooo.....another project bites the dust! LOL!!! On to the next adventure!!! This is Bonnies block from the Summer Breeze round robin. Funky button and bead flowers, a cabbage rose (beaded)... her initial....and the design outlined with beads on the lower corner. The fan is from Carole Samples book...and then the herringbone cretan stitch combos at the top. Hope ya like it Bonnie!! This is my nekkid block for a swap that I joined! A little funky.....but... kind of like me, I guess!!! LOL!!! I have to embroider half, send it off and then someone else will embroidery the other half and send it back! Should be interesting, eh? Mooooorrrreeee later!